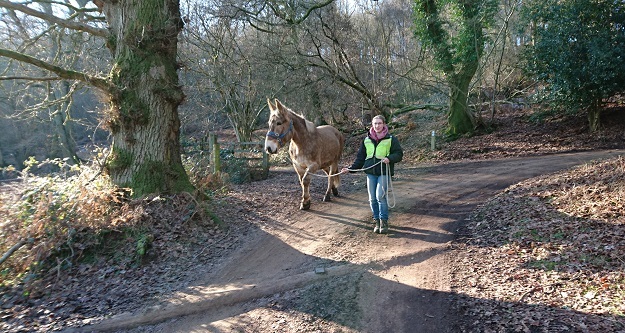 On Saturday we had another fantastic walk in the Punchbowl; nearly five miles of one, in fact! 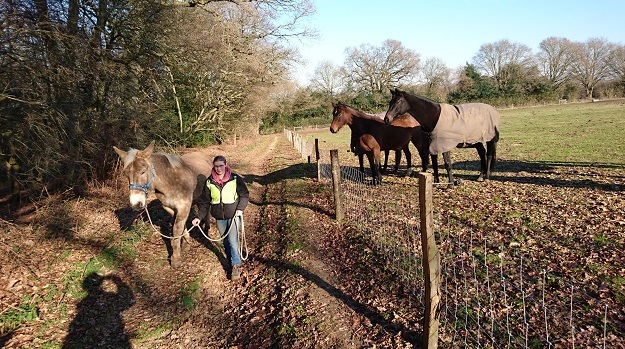 The chiropractor is due out to see Xato on Monday afternoon and the saddle fitter is visiting at the weekend, so we shall hopefully be riding again soon. In the meantime, I was quite happy to keep my feet on the ground. 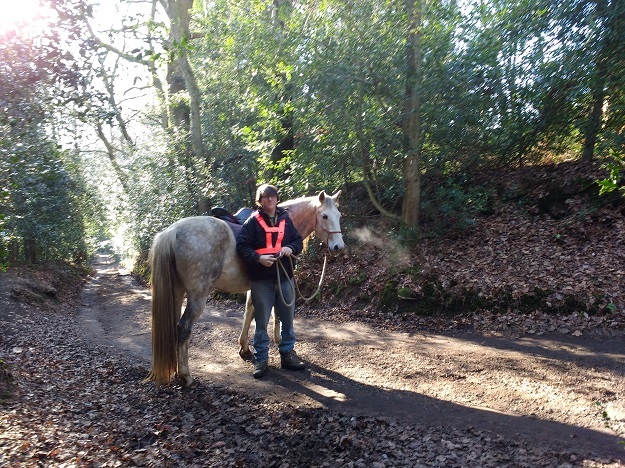 I know some people think me odd for hand-walking him, but it’s all good preparation for when he’s hacking out. I also feel that if I can not safely lead him in hand then I have no business riding him. 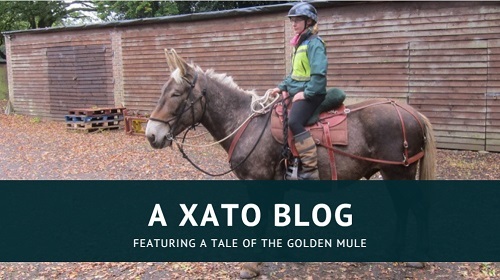 Our route this week was dictated by my idea of introducing Xato to the Smallbrook. I didn’t think he had any hang-ups about water – he has been quite happy to splash through puddles, and I knew that in Mallorca he’d been taken into the sea on more than one occasion – but I was still interested to see what he thought of crossing running water. I always lead with a loose line anyway, and I made sure he had plenty of rope in case he jumped – I didn’t want him to catch himself and feel as though he was being punished for making a decision. However, I guess it didn’t occur to me that I could actually shorten my rope instead of raising it skywards to keep it clear of his feet, which is why I look like some kind of crazed puppet master in this video. My excuse is that I was concentrating on finding the shallowest parts to place my feet! Three cheers for good leather boots! After crossing the stream, we clambered up the steep, tree-covered hill on the other side. 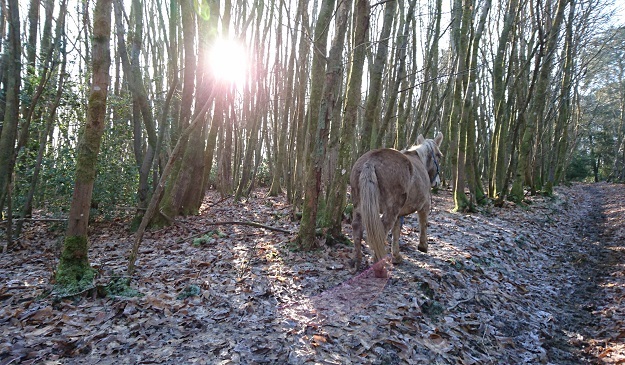 As the trail turned at the top we could hear someone with a chainsaw working on the other side of the treeline, but both equines strolled by like it was no big deal. Iris looks very world weary here. 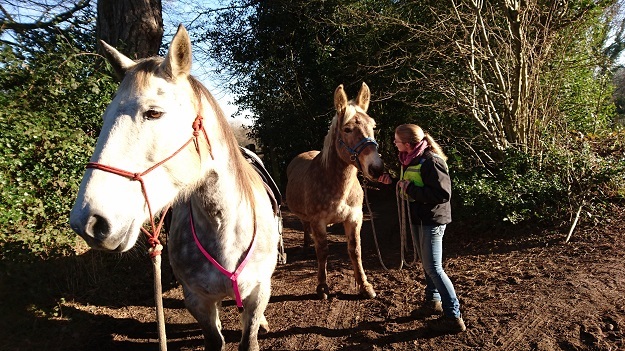 After that came the field of broodmares and yearlings, who were very excited to see such fine equines as ours. 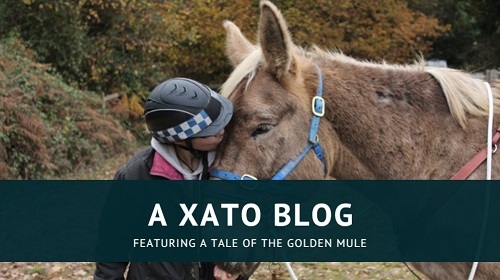 Xato coped very well with them cavorting and galloping around until right at the end, when they’d hung back for a few minutes before suddenly thundering off at top speed. He tucked his bum under and scooted forward a few steps and that was all. 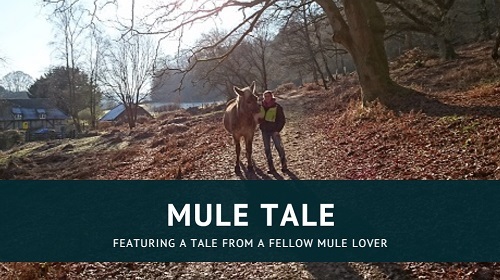 To be fair, it’s probably not every day that an enormous golden mule walks past their field. 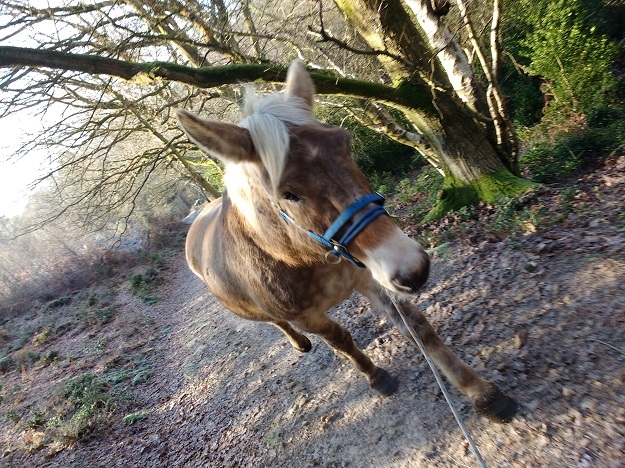 Then we crossed the Chestnut Woods, and Xato and I tried a little bit of off-roading. It was good fun and I think very useful to practice weaving in and out of the trees. His camouflage really is very good. Iris and Ben waiting for us to catch up. Next, we took the trail that led us back down into the valley bottom, across the stream again, and then back up the other side. 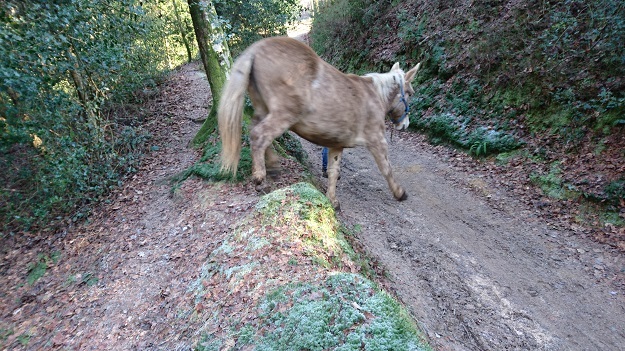 Both equines stopped to drink, but unfortunately we had to chivvy them on a bit as we could hear what sounded like a large group of mountain bikers above us, and did not want to meet them unexpectedly on the narrow, high-sided trail beyond. 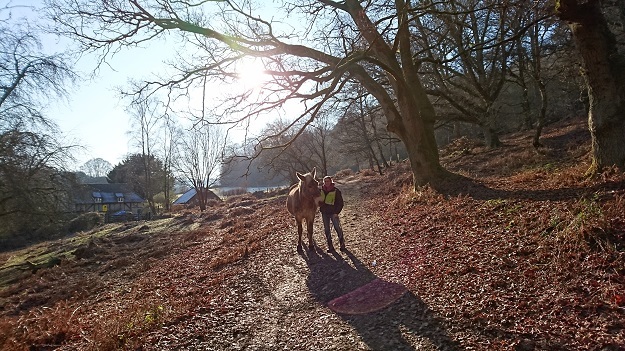 It was a very cold day, but the sun shone brightly. It made me feel very optimistic, like summer isn’t too far away. The 16th century cottage to our left is for sale; it would be my dream home if only it packed with the field behind it. It’s two miles from the nearest road or neighbour! 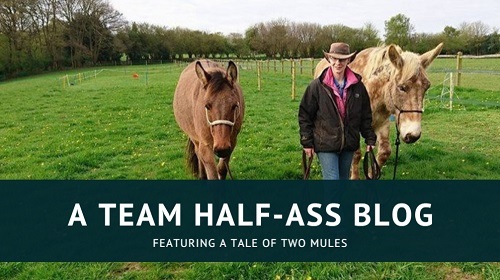 So, we did meet the mountain bikers, who kindly offered to pull over for us but we realised we could just take the equines up the bank instead. I’d expected Xato to jump down afterwards, but he just stretched himself out like a cat and stepped down! He is going to be a lot of fun under saddle! After that it was an easy, meandering climb home. Xato was a superstar throughout and I was very proud of him. 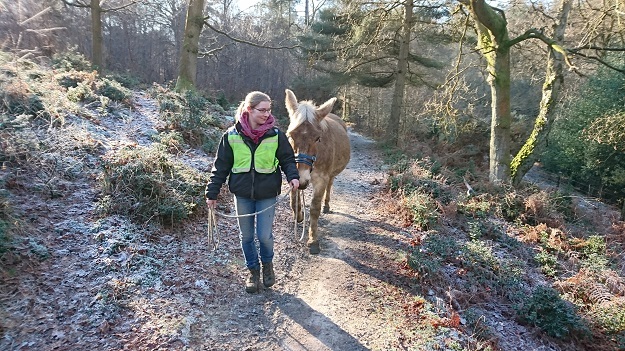 However, the thing I am most proud of is that I managed to do the entire walk without my trousers falling down; we’d left the house very quickly that morning in order to help a friend whose horse had escaped, and I’d forgotten to put my belt on. So I feel like both Xato and I were winners that day. The frost still lingered on this side of the valley. 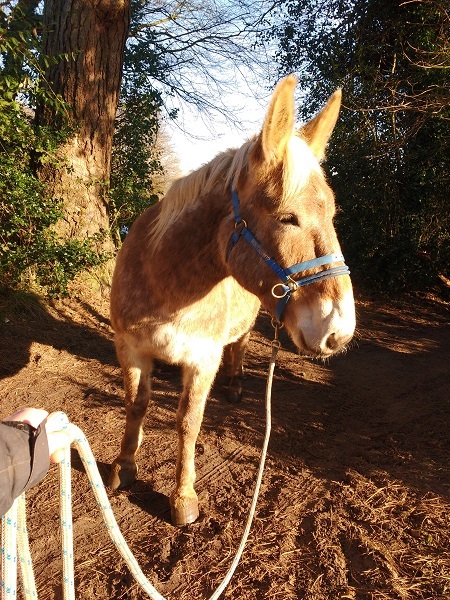 This mule is far too beautiful. 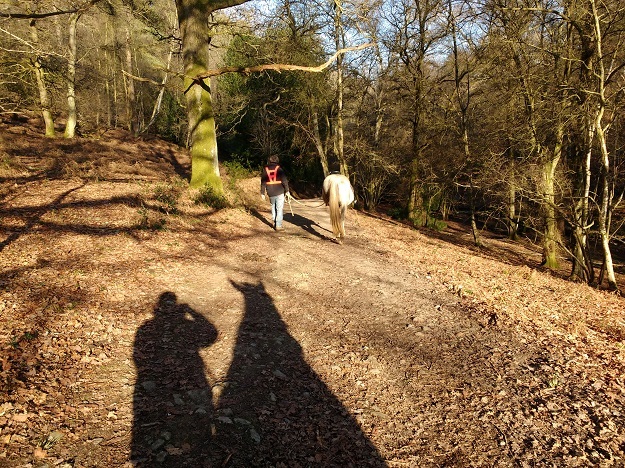 A couple of walking videos to end with.